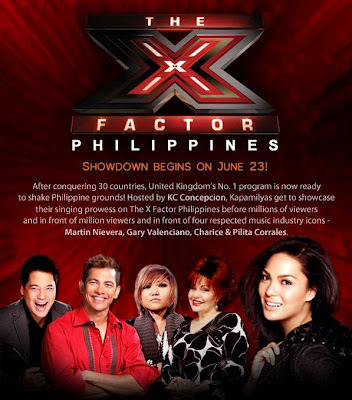 As we all waiting for the latest talent search franchise of ABS-CBN Kapamilya Network, "X Factor Philippines" is set to showdown on Saturday, June 23, 2012. Who will be the first grand winner of the X Factor Philippines? The X Factor Philippines host is none other than actress KC Concepcion. With the celebrity judges namely, the “Concert King” Martin Nievera, Youtube singing sensation Charice Pempengco, “Asia’s Queen of Songs” Pilita Corrales, and “Mr. Pure Energy” Gary Valenciano. X Factor is a singing competition and it may be solo, duo, trio or group performance. Comments or suggestions about "X Factor Philippines Latest Updates" is important to us, you may share it by using the comment box below.